The Metastatic Breast Cancer (MBC) Project — a crowdsourced, social media-driven effort to engage women and men with metastatic breast cancer directly as partners in research — has achieved a major milestone with its first public data release. The release, which coincides with the project’s second anniversary and the registration of its 4,000th participant, comprises a comprehensive combination of genomic data, treatment history and other information from patients' medical records, and patients' own reports of their treatment experience, representing a subset of the patients participating in the project. The de-identified data, which are publicly available via the MBC Project website, mark the launch of what will be a regular cycle of data releases that will be shared with patients and the research community using several public data platforms in order to accelerate the discovery of new clinical, molecular, and therapeutic insights. Conducted at the Broad Institute of MIT and Harvard in collaboration with Dana-Farber Cancer Institute and a coalition of nonprofit and patient partners, the MBC Project launched in October 2015 to accelerate a greater understanding of the biology of metastatic breast cancer. Approximately 155,000 women and men across the United States are living with metastatic breast cancer. The median survival is about 3 years – and more than 40,000 people in the U.S. die from metastatic breast cancer each year, accounting for 14% of all cancer deaths among women. Though treatments are improving, there is currently no cure for metastatic breast cancer. Only a small fraction of breast cancer patients receive care at centers that carry out research on tumor samples, making it difficult to recruit the larger number of patients needed for meaningful studies of tumor samples. To lower barriers to research participation, the project mounted a vigorous, ongoing social media and advocacy partnership-based outreach campaign, engaging patients with metastatic breast cancer personally and directly. In a testament to the project’s approach, more than 2,000 women and men from across all 50 US states registered as participants in the MBC project's first seven months. Thus far more than 4,000 people have signed on, with many providing essential input and feedback on the project's concept and scope. "Partnering with patients means much, much more than simply obtaining samples. It means working with patients to advance science together," said MBC Project director Nikhil Wagle, who is an associate member of the Broad Institute and a medical oncologist at Dana-Farber. The project collects a variety of data from participants, starting with a 16-question survey that captures basic demographic and medical information from each patient. Participants can provide consent for the MBC Project team to obtain and analyze medical records, saliva samples, blood samples, and tumor tissue collected in the course of their care. To date, more than 3,900 patients have completed the survey, more than 2,400 have given consent for access to their records and tumor samples, and more than 1,400 have provided saliva samples. "Patients have had an enormous impact on the project's evolution, including its design and implementation, from even before it had a name," said Corrie Painter, the project’s associate director of operations and scientific outreach. "Their enthusiasm had a ripple effect that allowed us to expand far beyond what we had originally thought we could do." To our knowledge, this is the first time this level of patient experience and medical record data has been made available together with genomic data in a public portal," said Wagle. "Patients are very excited that we now have generated and assembled the data, that we’ve kept our promise to make the data public, and that together we’ve created something tangible and positive from their experiences," Painter said. The team is releasing the data before conducting its own deep analyses and working on publications so as to accelerate research progress as much as possible. Going forward, the project team intends to release a new dataset every six months as sequencing results become available. 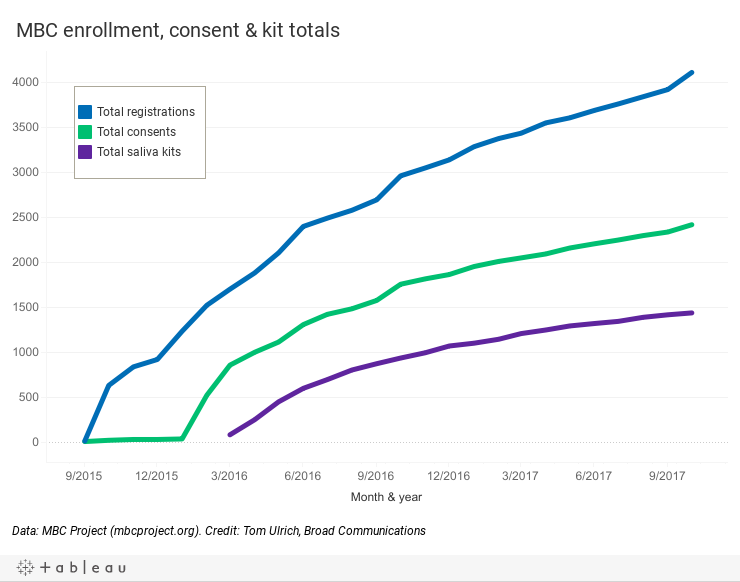 Hover over each line above to see more details about the MBC Project's enrollment growth to date. Looking back at over the last two years, Wagle and Painter note that they are pleased with how the project has progressed, but agree that much work remains to be done. "At two years, we can now say that we have all the pieces, and all the pieces work," Wagle said. "We can engage, register, and obtain consent from patients. We can access and abstract medical records. We can take in, process, and sequence tumor tissue and saliva. And we can put the end deliverable — data — out there for the world to use. Everything is feasible, which two years ago was not obvious. "Going forward," he continued, "we have to push to scale up and start making discoveries. We feel the urgency, we want to go faster. And we know the patients are willing to go with us as fast as we're able to take them." "I feel like we're at the tip of something that will ultimately be transformative for the entire community," Painter added. Data from The Metastatic Breast Cancer Project are publicly available at mbcproject.org/data-release. The project is one of two direct-to-patient cancer research initiatives currently underway at the Broad Institute. The other, the Angiosarcoma Project, engages patients diagnosed with a rare tumor of the blood vessel walls. A third, the Metastatic Prostate Cancer Project, will launch in the coming months. More information about these initiatives is available at broadinstitute.org/cmi. For more videos about the Metastatic Breast Cancer Project, view this playlist.